Supreme Court of India orders Haj subsidy cut. Phase out Haj subsidy in ten years: SC to Govt. India’s Supreme Court orders Hajj subsidy cut. Every year, about 125,000 Indian Muslims (most of them are rich – Ed. HE) are subsidised to go on the Hajj. 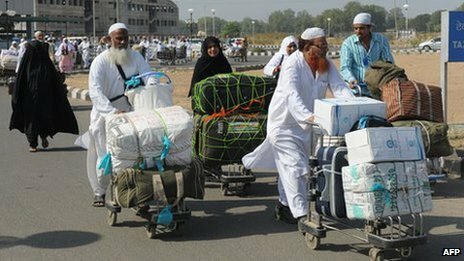 BBC input: Supreme Court of India has barred the government from giving subsidies to Muslim pilgrims going on the Hajj. The court said the policy was “best done away with” and told the authorities to gradually reduce the subsidy and abolish it in 10 years. The court also said that the government’s “goodwill delegation” to Mecca must not exceed two members. It currently has 30 people. India provides billions of rupees every year to people going on the Hajj. Pilgrims apply through the Hajj Committee of India and are offered a concessionary fare on the national airline, Air India. Every year, about 125,000 pilgrims take the subsidy. The pilgrims are charged 16,000 rupees ($302; £187) air fare. A regular Delhi-Jeddah flight would cost about double that. Last month, the government told the Supreme Court that it had decided to restrict the subsidy to one pilgrimage per person. 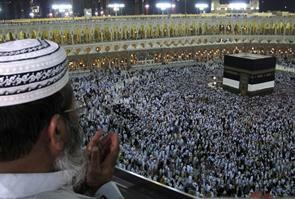 At the moment, it is available to a Hajj pilgrim once every five years. The government also said that priority would be given to pilgrims older than 70 and those who had never visited Mecca. Phase out Haj subsidy in ten years, Supreme Court tells Govt: 10 big facts. NDTV input: New Delhi | Reported by A Vaidyanathan | Updated: May 08, 2012 : The Supreme Court wants the central government to phase out its policy of giving subsidies to Haj pilgrims. 1. Directing the government to progressively “eliminate” its subsidy within a period of 10 years, a bench of justices Aftab Alam and Ranjana Prakash Desai said today, “We hold that this (subsidy) policy is best done away with.” This interim order is also applicable to the Haj pilgrimage of 2012. 2. The bench also directed the government to reduce the number of its representatives in the Prime Minister’s goodwill delegation from 30 to two. 3. The court also said that it will look into the functioning of Haj Committee of India and its process for selecting people for the pilgrimage. 4. The court was hearing an appeal filed by the Centre challenging a Bombay High Court judgement which had directed the Ministry of External Affairs to allow certain private operators to handle 800 of the 11,000 pilgrims earmarked under the VIP quota subsidised by the government. 5. The bench had expanded the purview of the plea and decided to look into the legality of the government’s policy on granting subsidies to Haj pilgrims. 6. Muslim members of Parliament have welcomed the decision. “The Haj subsidy of Rs. 600 crore is given to Air India and not pilgrims… Under this garb of subsidy, it (money) is going to Air India which is a sick airline,” Majlis-e- Ittehadul Muslimeen (MIM) chief Asaduddin Owaisi told reporters. 8. In an affidavit, the Centre had told the court that it has decided to restrict Haj pilgrimage at government subsidy to Muslims only as a “once in a lifetime” affair as against the existing policy of “once in five years”. It had said the new guidelines have been framed to ensure that priority is given to those applicants who have never performed Haj. 10. India has a quota of 1.70 lakh pilgrims every year. Of these, about 1.25 lakh are selected through Haj committees. Rest of the pilgrims go through private operators. The government subsidy is approximately Rs. 40,000 for each pilgrim selected by the Haj Committees. (with PTI inputs). “Politicising” Haj by permitting official delegations to accompany the pilgrims, for which the government offers huge subsidy, “is a bad religious practice.” – SC. Phase out Haj subsidy in ten years: SC to govt. HT input: The Supreme Court today struck down the government’s policy of giving subsidies to Haj pilgrims and directed that it should be progressively “eliminated” within a period of 10 years. “We hold that this policy is best done away with,” a bench of justices Altamas Kabir and Ranjana Prakash Desai held. The bench also directed the government to reduce to two the number of its representatives in the Prime Minister’s goodwill delegation. During the hearing in the case, the Centre had defended the policy of giving subsidies to the Haj pilgrims and had said it had framed guidelines so that people get subsidies only once in their lifetime. Read details. HINDU EXISTENCE WELCOME THIS VERDICT OF HON’BLE SUPREME COURT OF INDIA ON HAJ SUBSIDY CUT. WE WILL GO TO SC VERY SOON FOR GIVING IRRATIONAL AND UNJUSTIFIED IMAM AND MUEZZIN HONORARIUM BY GOVT OF WEST BENGAL. WE DEMAND COMMON CIVIL CODE FOR MUSLIMS IN INDIA. INDIA IS NOT A MUSLIM COUNTRY. HINDUS MUST NOT BE-FOOLED. SUPPORT US. Courtesy: BBC | HT | NDTV | ANI | AFP | The Telegraph- Kolkata. If according to Holy Quoran it is Haram to avail any subsidy for Haj , it must be stopped forthwith.Why this TEN YEARS time .Why for ten years Hindus would continue to pay (indirect) Jijiya ?Why the Muslim Mullahs do not stop this government provision which goes against Quran simply by a Fatwa , as they didin recent cases against Salman Rushdi, Taslima Nasrin and even Danish cartoons ?.It is simply because this is Gannamal i:e: indirect loot of Hindu money .The policy here is : Always Grab what you get and Ask for More..Ten years time is a ruse;I can guarantee that Haj subsidy is not going to stop.reservation were initially made for ten years and now it continues . The present S,C. Judgement in this case is defective and the earlier Judgement of S.C. in P.Goradia case would ultimately prevail, where the Apex Court declared that Haj Subsidy is constitutionally valid . I have written articles on it .More in my next. Its order of not to cut&phase out hajj subsidies by supreme court ,but its order to run haj-subsidies without hesitation for ten years!Anyone can not move to any lower courts to request for instant break on hindus-tax wastage on haj-subsidy!taxes collected by muslims are returned to them by making minorities policy&funds for them.judiciary is full of hindu-traitors now! Sup.court has very tacticali cleared Chidamberan thus saving him from Dr. subramaniam swami’s charges.Govt always appoints anti Hindutva judges who save the congress at crusial points. The judge who gave decision on the quranic ayats agaist muslims on a pamphlets published by Vishav hindu parishad, was transferred and later on retired. In a way he was punished for going agaist congress wishes. This entry was posted on May 8, 2012 by hinduexistence in Demand of Common Civil Code for Indian Muslim, Hindu Struggle, Hindus under Islamic Aggression, India under Islamic Aggression, Save Hinduism and tagged Haj subsidy, Phase out Haj subsidy in ten years: SC to govt, Supreme Court of India, Supreme Court of India orders Hajj subsidy cut.